"Knowledge is knowing that tomato is a fruit. Wisdom is not putting it in fruit salad." But what if you put it in ice cream? Adventurous? Daring? Nuts? We'll get to that in a sec. First, I wanted to talk about kitchen gadgets. I have a tiny kitchen with limited storage space and so I strive to only have kitchen gadgets that serve multiple purposes and if they don't, they should be items that I use very often. I don't own a full sized blender and have never felt the need for one. I'm not sure what I'd use it for. I do, however, have a Rocket Blending Set that takes care of my daily smoothie/protein shake addiction. (Ouch, I see that it has poor reviews on Amazon. Sad since I've had it for almost four years and never had a problem.) I got a food processor maybe a year ago. I can't remember now what I wanted to make and the universe sent me a free one. While I can't remember what it was, I do know that in the last year I've only used it a handful of times. Space, oh precious space. So after saying all of that, it should not surprise you that I do not own an ice cream maker. I LOVE ice cream. I will and have eaten ice cream for all meals of the day. Giving up ice cream due to some health "issues" was HARD. The morning after surgery I requested ice cream. Yes, I love it. But not enough to buy an ice cream maker. Ice cream makers and waffle irons may be the quintessential unitaskers. Oh sure you could think of different things to waffle - I've waffled Babka French toast. But apart from the now waffled look, you would have achieved the same thing on the stove top and probably with less mess. I had an old roommate who loved random kitchen gadgets. She probably bought one every week. She left a bunch of things that I'd never buy nor use - random thingamajig to peel boiled eggs, anyone? So what about you? Do you find that you have a lot of unitaskers in your kitchen? 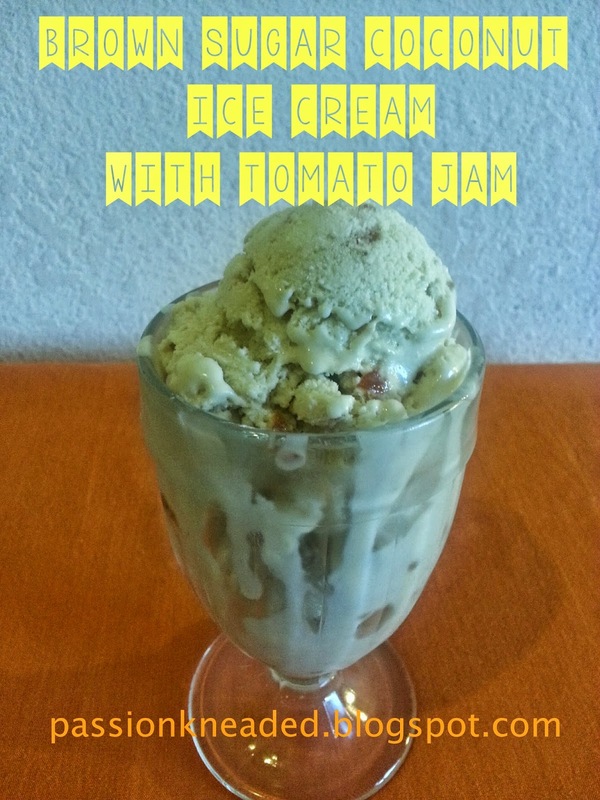 While I don't own an ice cream maker, there are several ways to make ice cream without one. Your ice cream may not be as creamy as one churned in a machine but it will still be delicious. 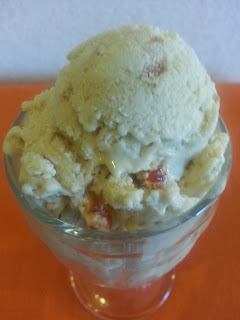 This particular ice cream is actually pretty creamy since I used that aforementioned food processor (second time this year!). The brown sugar works extremely well with the coconut and the gingery bits of tomato jam is a welcomed surprise. Don't let the tomato jam scare you. I used candy tomatoes that don't have that customary tart flavor. That plus brown sugar and ginger? You'd never even notice you're eating tomatoes in your ice cream. Finely chop the tomatoes – you should have approximately 1 cup. Add to a small saucepan with sugar. Continuously stir as the sugar melts and it turns into jam. After 15 minutes, stir in the powdered ginger. Stir periodically until it gets to the desired texture. This could take a total of approximately 30 minutes. Cool and refrigerate. Place one can of coconut milk in the fridge. Combine ¼ cup of the second can with the cornstarch. Mix well. Add the rest of the coconut milk to a medium saucepan with brown sugar. Sir occasionally. When the sugar has dissolved, approximately 5 minutes later, stir in the cornstarch slurry. Stir often so that the cornstarch doesn’t clump. After 10 minutes, remove from heat, cool and refrigerate for until chilled (at least 8 hours). 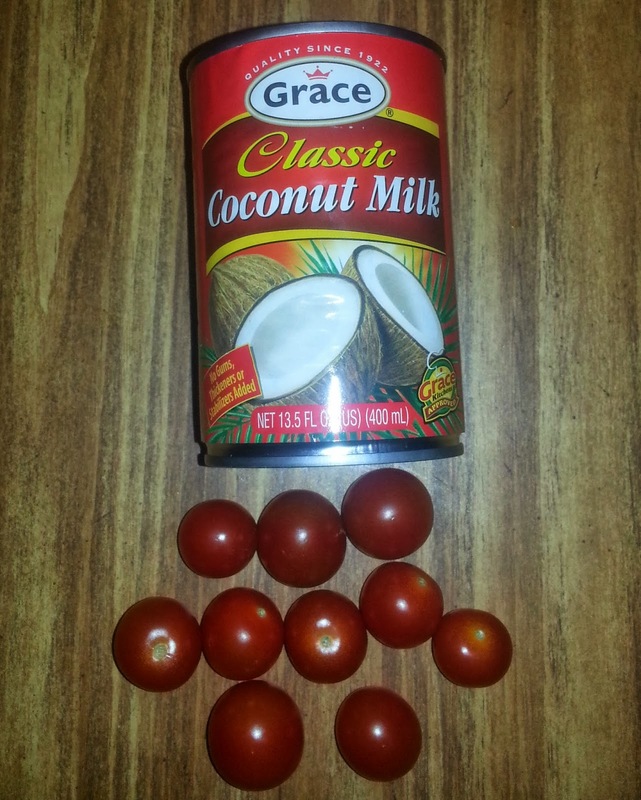 After mixture has chilled, carefully open the second can of coconut. Remove the solids and whip until doubled in volume. Add the remaining liquid to your custard then fold in the whipped coconut milk. 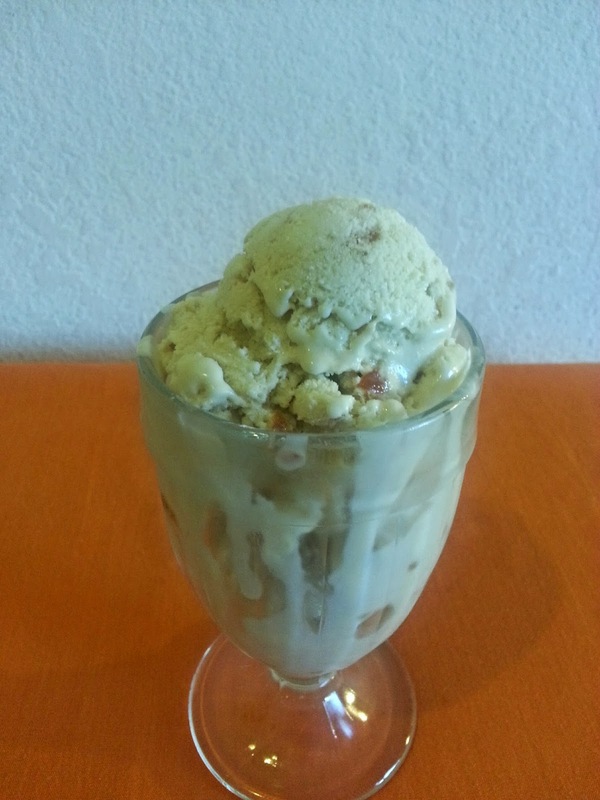 If you’re using an ice cream maker, add this mixture to your ice cream maker and follow your maker’s instructions. If not, let’s keep going. Place your mixture in a wide shallow container and freeze for 4 hours. You can also pour into ice cube trains or flattened zip top bags. The idea is to flash freeze the mixture to avoid ice crystals. Break apart the ice cream with a spoon and add to food processor. Process for 30 seconds. Transfer to a container, swirling in dollops of tomato jam. Freeze for at least 4 hours before serving. If you don’t have a food processor, you could remove the mixture from the freezer every hour and stir vigorously with a spoon or a hand mixer. A few years ago, I thought I would surprise a friend with baked goods for her birthday. I prefer to bake cakes but all my googling told me that cookies would be better to mail. I decided on something chocolate plus Nutella since she loves chocolate and has been known to eat a jar of Nutella in a short amount of time. Ha. As I searched for recipes, I also realised that she shared her birthday with World Nutella Day. Perfect, really. I made her three things - Nutella Lava cookies, Nutella Biscotti and Whattalottachoca Cookies. 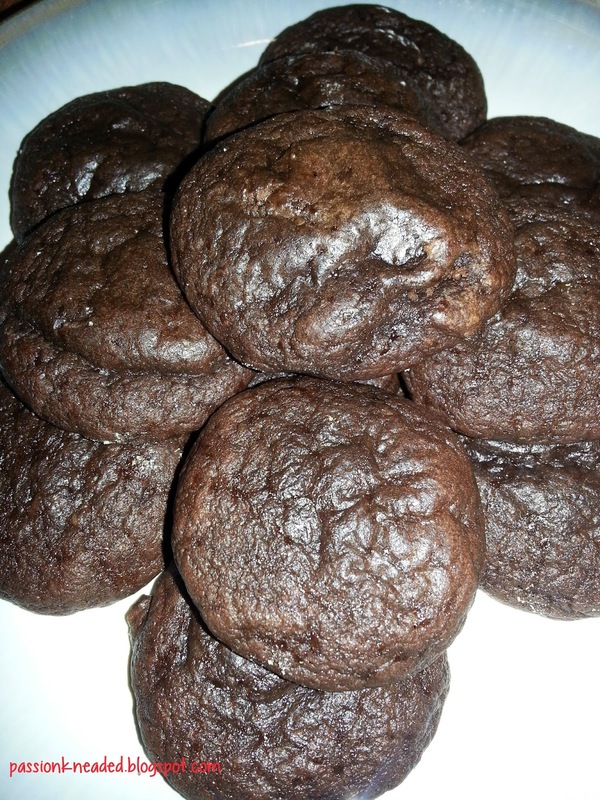 Of the three, I loved the Nutella Lava Cookies the most and made them several times since, with and without the Nutella. I don't know which my friend (would have) liked the most because the package never made it to her. Over a month later, it was returned to me. She never got the notification to pick it up and it just sat there and languished in the post office until they decided to send it back. When I first saw this Chocolate Party over on Roxana's Home Baking, I knew immediately that I wanted to make these cookies. But I didn't want to fill them with Nutella. Caramel? Dulce de leche? I had been using that a lot lately. 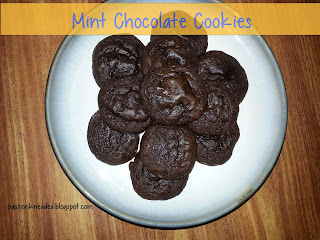 And then it hit me - mint chocolate! Melt butter over low heat then stir in chocolate and mint chips until melted. Remove from heat and cool slightly. Whisk egg, sugar and vanilla in a small bowl for two minutes then slowly incorporate into cooled chocolate mixture. Be sure to whisk constantly so as not to curdle egg. Combine flour, baking powder and salt then fold into chocolate mixture. Scoop 1 tablespoon balls and place on baking sheet approximately 2 inches apart. Notes You can make these cookies as large as you want! I went with small bites this time. Just adjust the baking time accordingly.